If you have ever had difficulty piecing a garment or quilt, you know how important your choice of needle can be. As a general rule, always select the needle size to accommodate the thickness of the thread being used and the needle point style to accommodate the type of fabric. The finer the fabric, the finer the needle and thread you should use. If your thread is shredding, the needle is too small. You should always change your needle after 6 - 10 hours of sewing. Consult your sewing machines user manual and use the needles they recommend. If you are changing to a specialty needle for a specific task, store your regular needle in a pincushion, not in a drawer or on the floor. 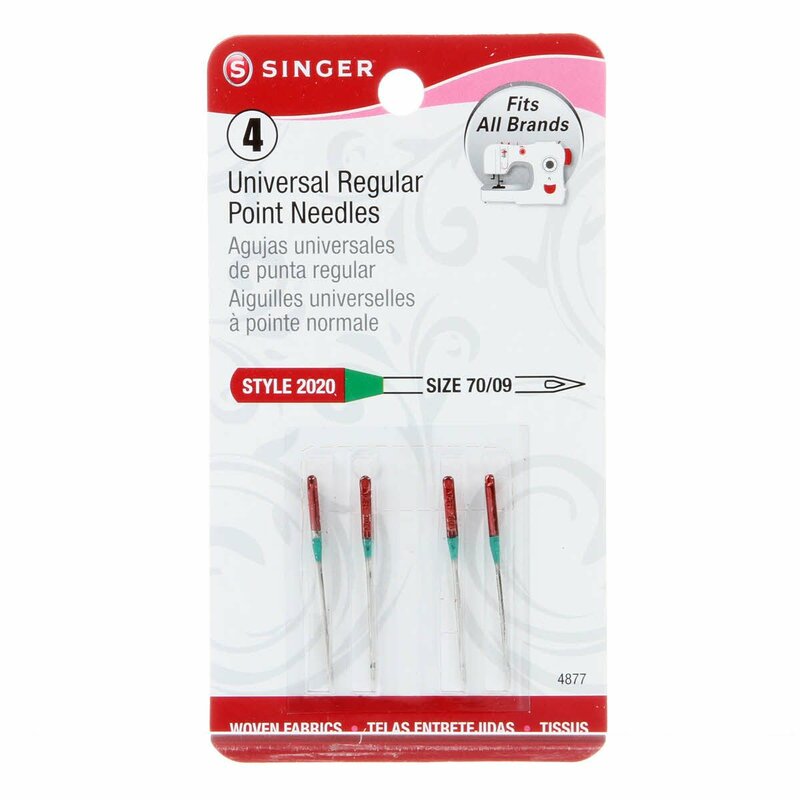 Universal Point Needles are a great all-purpose needle. 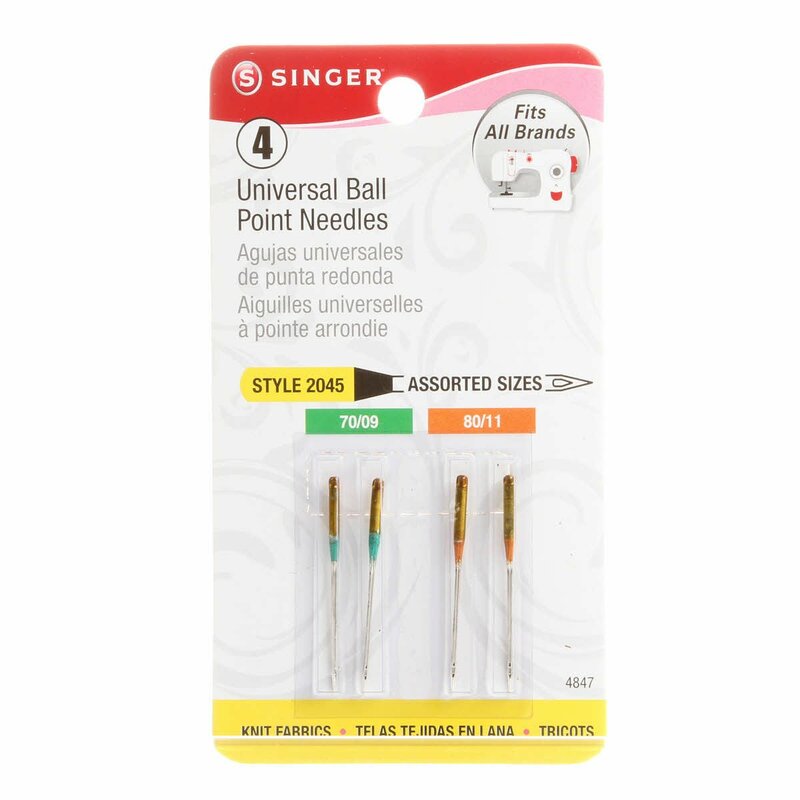 This needle has a very slightly rounded tip that is still sharp and can used for general sewing of most knit and woven fabrics. Use 60/8 for silks; 70/10 for lightweight fabrics or when using nylon or monofilament thread; 80/12 for medium weight fabrics; 90/14 for medium to heavyweight fabrics or when paper piecing; 100/16 for heavyweight fabrics and 110 for upholstery fabrics. Singer codes this needle with a red top. A Ballpoint or Jersey Needle has a slightly more rounded tip than a Universal. It is not as likely to snag knits and stretch fabrics. A Stretch Needle also has a rounded tip. It's specially shaped shank creates good stitch formation on elastic or highly elasticized fabrics such as spandex. Use a 70/ 10 needle. This is also a good needle for faux fur and fleece. Use a 90/14 needle. A Quilting Needle has a slim, tapered point and slightly stronger shaft for stitching through multiple fabric layers and across intersecting seams. Use a 70/10 or 80/12 for intricate designs. Use a 90/14 if your quilt sandwich is thick. A Sharp Point Needle (also called a Microtex needle) is thinner and sharper than the universal point. It makes a perfect straight stitch. Use it on very fine fabrics (including high thread count quilting cotton material) and chintz. It is an excellent all purpose needle for piecing, appliqué and quilting. An 80/12 is fine for general piecing and machine quilting. If you are using tiny threads (like bobbin, lingerie, invisible) in machine quilting, use a size 60/8. Singer codes this with a purple top. A Skip-free Needle has a deeper groove above the eye (scarf) and flatter shank than a Universal. Good for synthetic knits and faux suede. Use an 80/12 needle. A Jeans or Denim Needle has a very sharp tip, slender eye and a strong shaft. This is good for sewing on tough, heavyweight fabrics such as denim, duck and canvas. Use a 90/14 or a 100/16 needle if sewing on these fabrics; a lighter 70/10 or 80/12 if sewing on cotton. Singer codes this with a blue top. A Leather Needle has a shape like a wedge at the point which makes a clean, large hole as it enters the fabric. This gives it good piercing power for unyielding fabric such as real leather, suede or heavy vinyl. Use a 110/18 needle. Embroidery Needle This needle has a larger eye, a slightly rounded point and a deep scarf (groove above the eye) to protect decorative thread from shredding or breaking. Slightly rounded point; long eye. Use a 70/10 needle for dense embroidery. 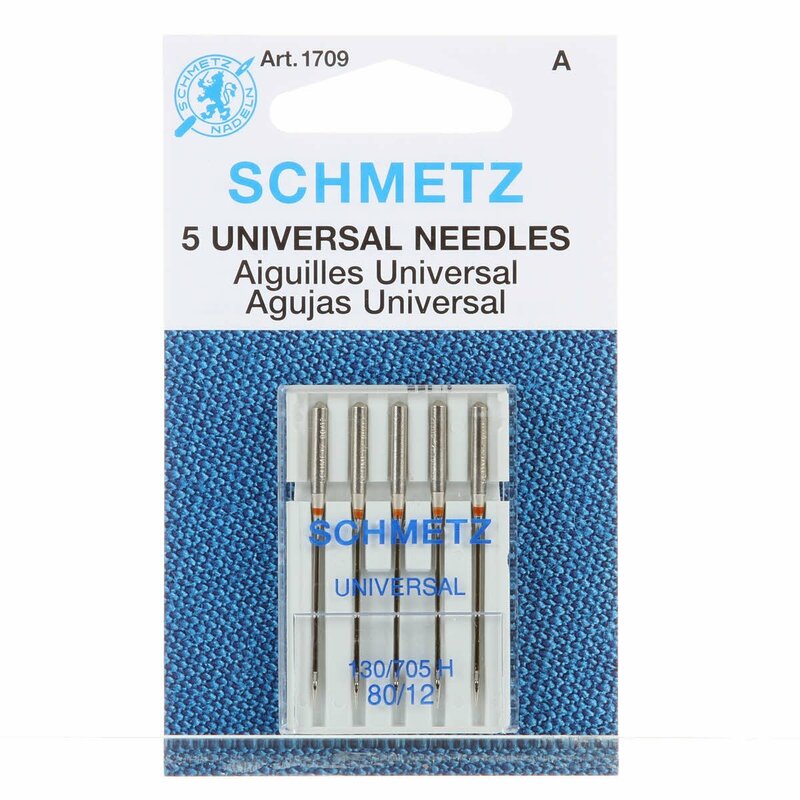 A Metallica Thread Needle has a larger Teflon coated eye which reduces friction but still accommodates heavier threads and reduces spitting and shredding on delicate metallic threads. Use a metallic needle when sewing with monofilament or invisible thread. Put a cover or cap on the spool so it doesn't unwind. A Topstitching Needle has an extra-large eye and deeper groove for use with heavier topstitching thread, when using multiple threads through the needle, or using decorative threads. Use size 80/12, 90/14 or 100/16 depending on the application. The larger eye helps with trilobal threads, such as Superior Rainbows. 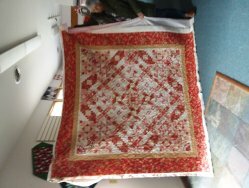 For free motion quilting, use a 90 or 100 needle with a slightly looser top tension.